How Much Could You Raise By Selling All Your Stuff in an Emergency? Have you ever looked around your house and wondered what all of your stuff is worth? I guess that the majority of us have pretty much no idea what our possessions are worth. This got me onto thinking about how much we could raise in an emergency by selling everything. Maybe you could guess a figure in your head and then go through the following list to see if it matches that initial estimate. I was torn on the question of including the value of the house or not. I suppose that if it was a real emergency you might decide that the only way to get hold of some serious cash would be to sell your home. It isn’t always a quick and easy way of freeing up money though, is it? For that reason, I decided to stick with just the contents of the house. What is your furniture, kitchen appliances and everything else in there worth? I sold quite a lot of things a few years back when I took a year off to go travelling and I know from bitter experience that selling second hand furniture doesn’t bring in that much cash. For example, I sold a lovely big wooden table. I had only bought it a year or so before but I took a huge hit on it. Someone got a bargain that day and if you are going to be selling stuff in a hurry there are sure to be a few bargains in there too. 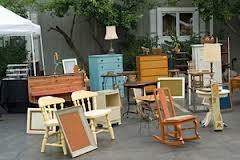 However, if you have accumulated a lot of possessions it could add up to a tidy sum overall. If you add up the price you paid for everything then you can expect to get between 20% and 30% of the original price you paid for it. Sometimes you might get more, it all depends on the item. I have kept your clothing separate from the contents of your house, as it is worth its own section. You might think of a garage sale for your old clothes but there are other options these days. You could use a specialist website or smartphone app to do this as well. You could even set up your own online store really simply through the likes of Storenvy, You would expect to get more this way than through a car boot sale or by selling it direct to a local second hand store. The main problem with the online approach is that it could take a while for you to start selling some clothes and earning money. The price of second hand clothes can vary greatly, so check out some sites and see how much other people are charging for similar garments. Could you bear to sell your car? For many of us this is one of our prized possessions. It is also one of the easiest ways to free up some cash. By going down to an auto dealer you can usually sell a vehicle more or less right away, although you won’t get the best price for it in a place like this. A private sale will get you the best price but this could take some time. The best way to look for a private buyer is to advertise the auto online. It is a good idea to carry out any little jobs needing done on it and get it looking spotless if you are looking to achieve the highest possible sale price. In fact, this piece of advice is spot on for anything you want to sell. The Official Kelley Blue Book website will help you work out a price. How much could you earn by selling everything at short notice? Would you buy Michael Jordan’s house? 10 Responses to How Much Could You Raise By Selling All Your Stuff in an Emergency? We moved 4 years ago and at the time we cleared out a lot of stuff. But we didn’t sell anything. We just put some stuff out by the road with a free sign and man did it ever go quick! I’ve taken clothes to a consignment shop f couple of times but you can’t make much with that. We’ve never tried Craig’s list because we just don’t want to deal with the phone calls and people coming by to see stuff. We do give stuff to Goodwill or Habitat for Humanity’s re-sell store. I’m a minimalist, so I would guess maybe £2-3k if I sold it all!! I probably wouldn’t be too far away from that figure myself for things around the house MS.
At least in the US, we have this thing called a title loan that you can do on your vehicle if you own it free and clear. There’s two varieties though…one is a shady, high interest almost like a payday loan sort of thing. The other is essentially refinancing your owned vehicle through a bank or insurance company. Depending upon the direness of the situation, this could be another alternative. I listed a few things on ebay this week, but only a few items have actually been bid on. I even listed one thing at 99 cents, but still, nothing. It definitely isn’t as easy to sell things on ebay Stefanie, despite what other people might tell you. Our car is relatively new, so we could probably get at least 8k for it. The rest of our stuff… yeah, we’d be lucky to get more than a couple hundred for the big items.